There was recently an update to WinterBoard Settings. I actually have not done a review for two updates now so, I will talk about both the 0.3.0 update and the 0.4.0 update. 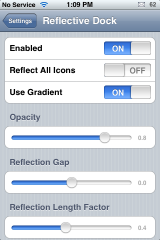 The 0.3.0 update adds an “Enabled” button to WinterBoard Settings. This button actually enables/disables the any mods/themes/hacks that are installed for WinterBoard. It basically turns WinterBoard on and off. So, if you have Enabled turned off, if you make changes in either the WinterBoard application or WinterBoard Settings, they will not display. 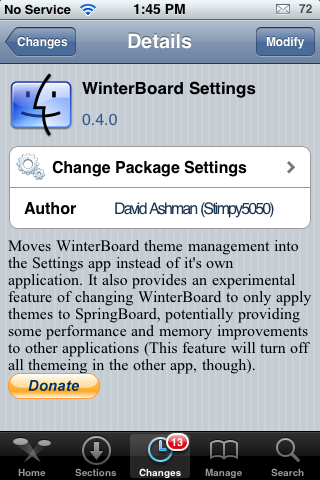 I was surprised when I opened Cydia this morning and saw a WinterBoard Settings application. I was like…Shut Up! 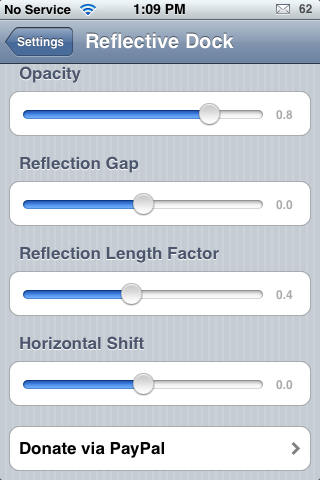 I totally thought we were going to get some sweet new settings…maybe some interface settings and what not. Well, that is not exactly what this app is. 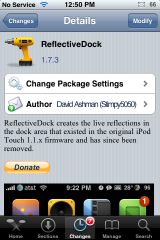 The Reflective Dock mod is a mod that allows the icons on your dock to have reflections. 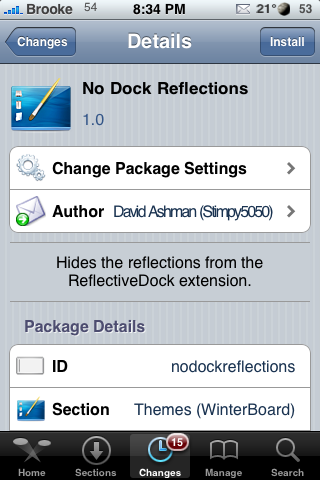 Well, it seems that Mr. David Ashman has updated the mod adding all sorts of new settings. 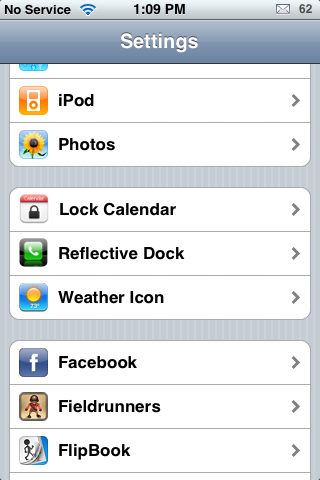 Once installed, you can now go into your stock Settings application and you will see a Reflective Dock option. 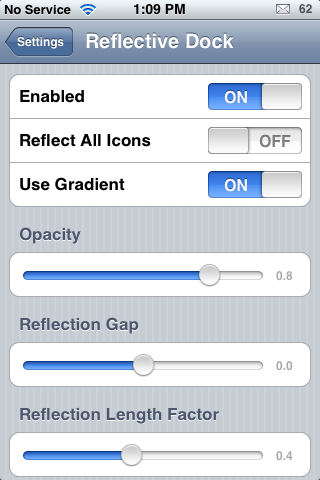 Here you are able to Enable/Disable the application (no more need for WinterBoard), turn on/off the Reflect All Icons option, turn on/off the Use Gradient options and adjust the Opacity, Reflection Gap, Reflection Length Factor and the Horizontal Shift. Yesterday there was an update to Dismiss Away Items, a application that allows you to dismiss alerts pop-ups by tapping the Home Button. The update changed the app so that it only works for dismissing alert pop-ups on your lock screen (instead of on your lock screen, SpringBoard and while in an application). However, the developer also released an additional application titled Quick Dismiss. When installed, it allows you to dismiss alert pop-ups using the Home Button while on your SpringBoard and while in applications. So basically, the developer turned Dismiss Away Items into two applications. However, the first release of Quick Dismiss did not work so, I patiently waited for an update which came out this afternoon and the application now works correctly. 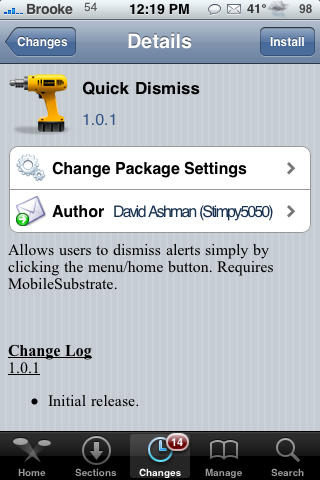 Make sure you have version 1.1.0 of Quick Dismiss. 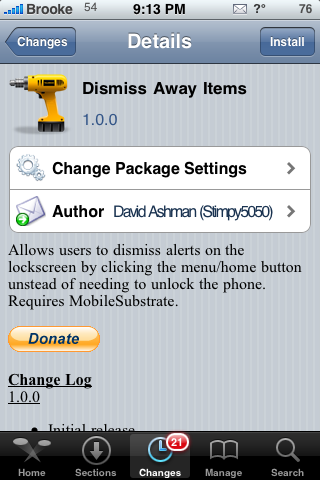 Dismiss Away Items is a mod that allows you to dismiss alerts by tapping the Home Button. Once installed, you are able to dismiss the pop-ups for missed SMS alerts, missed call alerts, missed voicemail alerts…etc…just by tapping your Home Button. In the app description it says that this works on the lockscreen (which it does) however, it also works if you are on your SpringBoard or in an application. The nice thing about this mod is that it still displays a missed alert badge even though you have dismissed the pop-up (ex. still leaves a badge number on your SMS icon or Phone icon). If you are not currently using an application, like IntelliScreen, to block your alert pop-ups this might be a mod for you. 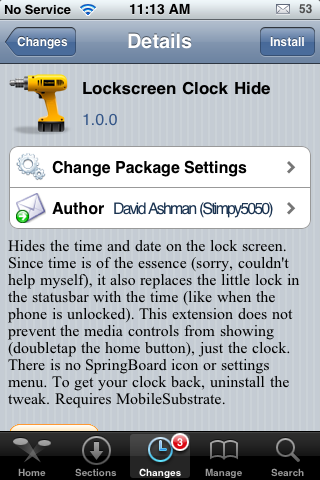 I personally do not use an alert blocker (unlike Doug who uses IntelliScreen) so, this mod works great for me…I can read the alert and then dismiss it without having to go off my lockscreen. I was excited to see the update to the WeatherIcon mod last night…the updated boasted improved battery performance, memory improvements, fixing the Safe Mode issue and better rendering of the status bar icons…all of which I was very excited about!! So, I updated the app last night and instantly encountered a few problems. After updating, all I would get was a ? on my status bar and my weather icon. I restarted my iPhone and then waited a bit and the ? did eventually go away (though, it continued to come back randomly throughout the night). Well, it seems this was fixed with another update to the app this morning! Which, so far, has seemed to fix the problem. However, I am still having a few other issues. 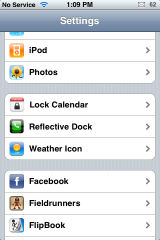 There have been a few updates to the WeatherIcon mod in the last day or so. They have been just simple updates but, I was happy to see them. If you use the Status Bar icons feature of the mos, then you have probably noticed that the right side of your weather image was getting cut off. Well, the first update fixes that issue. However, you probably also notice that he right side of your other Status Bar notification icons (mail, SMS…etc) where also getting cut off. The second update fixes that issue. So, overall, the mod looks much nicer now! The only thing I am waiting for now is an update that fixes the battery drain problem! Doug and I both have been experiencing major battery drain since turning on the Status Bar mod. The WeatherIcon mod received a few updates overnight. 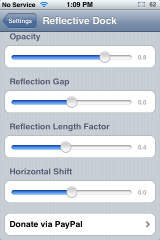 The update to version 1.8.4 makes a few changes to the application that you will want to know about. The most obvious change is that it removes the icon theme from the package. So, when you update to version 1.8.4 you will no longer see a weather image just the actual weather in degrees. In order to have a weather images, you will need to install either the Katra WeatherIcon theme or the Klear WeatherIcon theme based on which weather images you prefer (see screenshots below). 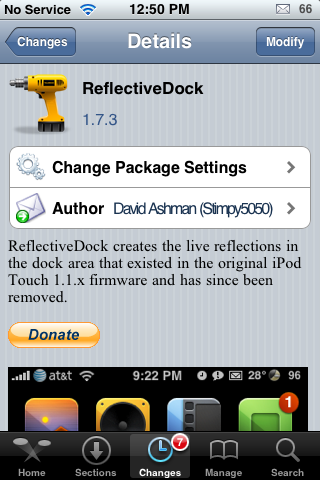 Both of these themes are available through the david.ashman.com source.